Robert W. Kennedy joined the City of Cleveland as Director of Port Control in January 2017. In this capacity he provides leadership and oversight for two airport assets: Cleveland Hopkins International Airport (CLE), Cleveland Burke Lakefront Airport (BKL) and the Division of Harbors: including the city’s North Coast Harbor. CLE is the United States’ 45th largest airport welcoming 8.4 million guests in 2016 and BKL is the regions' preeminent general aviation gateway located in downtown Cleveland. As Director of Port Control, duties include leading the more than 375 airport staff in the execution of airside, landside, customer service, security, maintenance, finance, commercial development, and physical infrastructure development functions to accommodate over 120,000 annual flights and provide an outstanding workplace for more than 6,200 on-airport employees. Responsibilities also include ensuring airport operations remain unimpeded while overseeing delivery of more than $40 million in capital projects. Prior to joining the City of Cleveland, Robert held the position of Vice-President, Consulting Services for Aviation Strategies International, were he had executive responsibilities focused upon aviation advisory services. The company provides airports and governments with corporate level strategic advice and consulting services in the field of civil aviation. With more than 30 years of aviation experience, Robert has a wide variety of experiences within civil aviation including being appointed to interim general and deputy general manager for the world’s busiest airport, Hartsfield-Jackson Atlanta International Airport (ATL). At ATL he also served as the general manager of Operations, Maintenance and Security at ATL and served as the airport’s director of marketing, public relations and intergovernmental affairs, and route development manager. In the private sector, Mr. Kennedy founded and served as president of Kennedy & Associates Aviation and Air Cargo Consulting, which provided airports, air carriers and aviation-related industries with in-depth analysis and planning for route development, cargo master planning, and air service development. He has received the two highest airport industry accreditations: the Accredited Airport Executive (AAE) designation from the American Association of Airport Executives (AAAE) in 2008. In 2009, he earned the International Airport Professional (IAP) designation, an accreditation awarded jointly by the Airports Council International (ACI) and the International Civil Aviation Organization (ICAO). Mr. Kennedy has been involved in numerous institutions and business organizations. 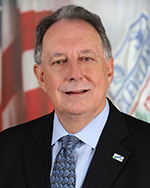 He has been a Senior Aviation Advisor to the United Nations' CIFAL center in Atlanta, Georgia including the development and implementation of aviation programs for local authorities and executives. He led CIFAL’s efforts in hosting several aviation-related training programs, including security conferences for Chinese aviation officials in preparation for China’s 2008 Summer Olympic Games. Additionally, he served as Chairman of Airport Council International – North America’s (ACI-NA) Economic Committee and Air Cargo Committee; board member, Georgia Foreign Trade Zone; Chairman and President, Atlanta Air Cargo Association and board member, Clayton County Chamber of Commerce. He has been twice named Clayton County’s International Business Person of the Year.